Katalog 1439 (PDF) enthält nur sechs ganze Handschriften, Nr. 7-58 sind Einzelblätter, Nr. 59-70 Urkunden und Briefe. Nr. 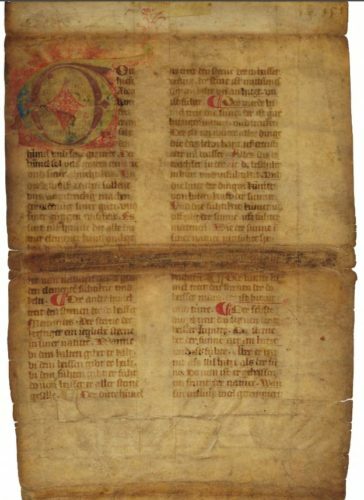 49 ist ein Fragment aus einem Psalter aus der Mitte des 9. Jahrhunderts. „Post-medieval inscriptions here read ‘Lit. C’, ‘Besigheim’, ‘Archiv’ and ‘1587’.“ Es könnte also eventuell aus einem Kraichgauer Adelsarchiv stammen. Nr. 52 gehörte zu einem Trägerband, der dem Kloster Schuttern OSB und später der Mehrerau gehörte. „REMIGIUS AUTISSIODORENSIS. Commentary on Bede’s De schematibus et tropis, substantial fragments of four leaves preserved in situ as the pastedowns (now unglued) and board-liners (beneath the turn-ins) of an early sixteenth-century Sammelband of printed books (Gregory the Great, Secundus dyalogorum liber . . . de vita ac miraculis beatissimi Benedicti, Venice, 1505; and Honorius Augustodunensis, Elucidarius dialogic[us] theologi[a]e tripertitus: infinitar[um] q[uae]stionu[m] resolutivus. Vade mecu[m], Basel, 1508), written in double columns in a compact Caroline minuscule in brown ink, up to 14 lines visible, ruled with a hard point (written space double-lined at inner and outer margins), one or two interlinear or marginal annotations in the hand of the scribe; slightly dust- and glue-stained, but in good condition and entirely legible. [70 x 120 mm] Southern Germany, 10th century.£12,000 Newly identified fragments of a commentary on Bede’s De schematibus et tropis which has been plausibly attributed to the prolific Carolingian schoolmaster Remigius of Auxerre (Remigius Autissiodorensis, c. 841–908); see J. P. Elder, ‘Did Remigius of Auxerre comment on Bede’s De schematibus et tropis?’, Mediaeval Studies,vol. 9, 1947, pp. 141–50. To the best of our knowledge the only previously known copy of the text is the one described by Elder, namely Vatican Library Reg. Lat.1560, ff. 127v–137r, a manuscript dating from the ninth or tenth century. The present fragments, which can be dated to the tenth century, are therefore potentially important witnesses to the text and its dissemination. The parent volume was of small format, and there are notes and corrections in the hand of the scribe, suggesting that it was copied for his own use. Provenance: The volume in which the fragments are preserved, which unites several works of didactic importance for Benedictine monks, bears the inscription on the front pastedown ‘liber Beate Marie Virg[inis] in Schuttern Anno D. 1517’ and, in the same hand on the title of the first work, ‘liber Beatissime semp[er] virginis Marie in Schuttern’ (followed by additional text, crossed through, including the date ‘1517’). This is the important imperial abbey of Schuttern in south-western Germany, which was founded, according to tradition, in 603 by the wandering Irish monk Offo and dissolved in 1806. The present fragments may therefore have been written at Schuttern. […] The volume also bears the later (eighteenth-century) inscription on the title of the first work ‘Ex Bibliotheca Monasterii Brigantini’ (i.e. Bregenz on Lake Constance)“.